Long ago, Farut was selected to become a member of the Children of the Guardian. 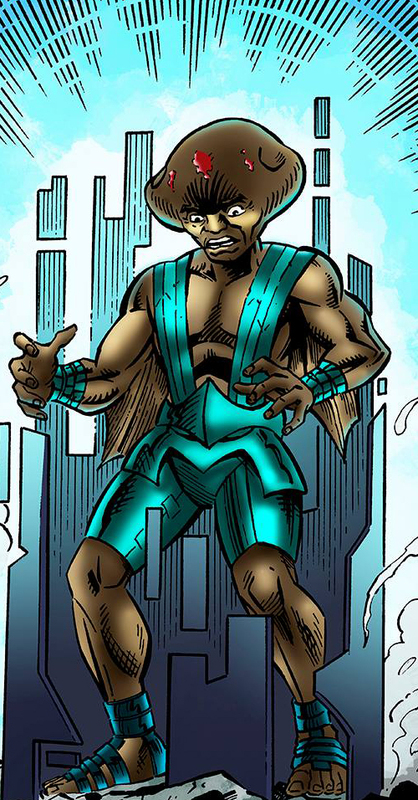 Under the leadership of Rubikhon, he helped save and protect his world, Neosa, from various threats but primarily from the BahNu. Some 250 years later, a being showed up in the Neosian system. His name was Silverlance. He had been lost but he was welcomed to Neosa because he too was a child of the Guardian. Farut and the other Neosians befriended him and Farut helped him find his way home. Their frienship became stronger when Silverlance eventually settled on Neosa and joined Farut's group. Years later, the rogue guardian, Q'Aestor, arrived at Neosa. He was hunting guardians and killed every member of Farut's team. Farut managed to escape for a while and sent the only other guardian, Geomass, to warn Silverlance's former team, Gaia Force. Farut was eventually captured and tortured by Q'Aestor into revealing the location of Gaia Force's home world. Techno clairvoyance: Farut has the ability to decipher the use of any piece of technology. Through this process he has managed to decipher the BahNu technologies left behind after the Guardian banished them. Enhanced intelligence: Farut's intelligence has been augmented to complement his techo clairvoyance. Once he deciphers the technology, he can replicate it. Constructs: Farut has the ability to create objects out of energy he channels out of his body. Space travel: Farut can survive and travel the rigourous expanses of interplanetary space. Super strength: He has enhanced strength enabling him to lift weights in the ten ton range. Self sustaining: Does not need to eat or drink. Physical/energy resistance: He can resist attacks of the highest magnitude. Omnilinguilism: Like all guardians, he can communicate with any intelligent race. Enhanced vision: He can see in various modes and can stare directly at the sun. Extended lifespan: Farut is currently over 600 years old. Weaknesses: Farut's physiology is resistant enough to allow him to stand the rigorous expances of outer space, but his skin can be breached and he can bleed. Limitations: In order to decipher an object's true purpose, Farut must see it. When Q'Aestor had him prisonner, Farut did not know the function of the probe attached to his head because he had not actually seen it.